Giving Is Gorges And Henry V! Show your support for Ithaca Shakespeare on Giving is Gorges day, this Friday, August 28! Giving is Gorges is a chance for our community to come together on a single day and collectively show our support for the causes we believe in. It was established by a collaborative group to celebrate the spirit of philanthropy in Tompkins County and surrounding areas. This is a unique opportunity to highlight how we can work together to share commitments and build a stronger sense of community. Your support is absolutely essential to keep Ithaca Shakespeare going. As we continue to grow, adding new programs like our Shakespeare for Kids summer camp and constantly working to improve the quality of our performances, it becomes more and more difficult to cover the costs of our programs. Like most theatre companies, ticket sales cover less than 50% of our expenses — especially since we make a great effort to keep our shows affordable for all audiences. The rest must come from grants and donations, but grant support has been steadily decreasing in recent years, creating a funding gap that we must find a way to close. Your gifts can help us bridge this gap. If you think Shakespeare matters — if you think our productions and education programs have value in our community — please take this opportunity to make a gift that will help keep Shakespeare alive and well in Ithaca. Please help make Giving is Gorges day a great success, while helping to make 2016 a great year for Ithaca Shakespeare! 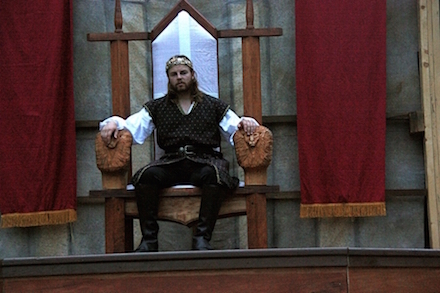 The third production in our series of Shakespeare's history plays! 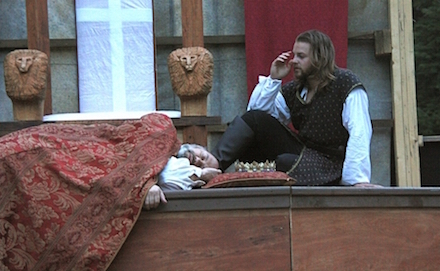 In Richard II, Henry Bolingbroke took the throne for himself, deposing and murdering the lawful king. In Henry IV, he fought to contain the rebellions that broke out against his rule, while his unruly son, Prince Hal, struggled to find his place in the world. Now Henry IV is dead, and Hal has taken the throne as Henry V. As king, he must put his wild past behind him and find a way to unite his fractured country in a common cause. Taking his father's dying advice, he gathers the warriors who had rebelled against his father and leads them to war with France. There he wrestles with the responsibilities of kingship while attempting to mould his forces into a true band of brothers...before they must face a much stronger enemy at the battle of Agincourt. Henry V is both a patriotic play and an anti-war play, the culmination of the coming-of-age story begun in Henry IV and a complex examination of leadership, warfare, and political morality. It has romance and comedy, some of Shakespeare's greatest speeches, and a devastating battle sequence that is unlike anything else that Shakespeare wrote. See the continuation of this epic story at the Hangar Theatre in February!